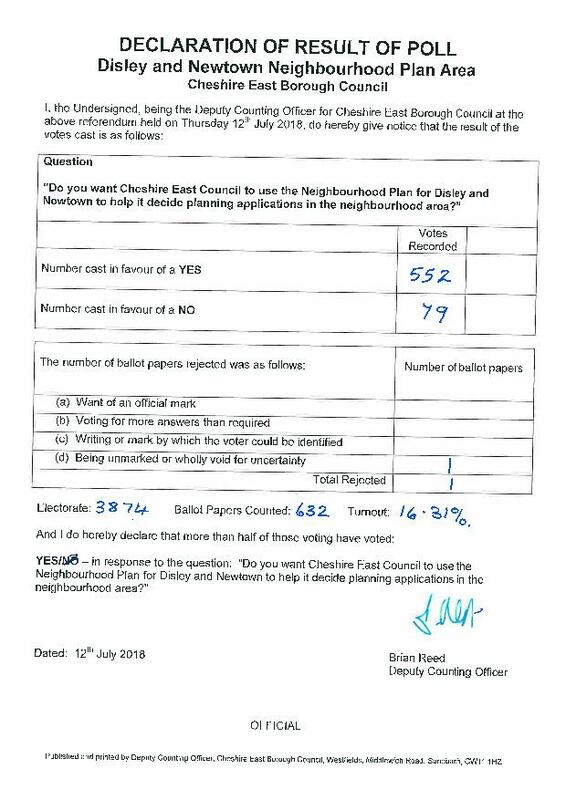 The Disley and Newtown Neighbourhood Plan Referendum took place on Thursday 12th July 2018. The Polling Station was Disley Methodist Church and the voting hours were 7am to 10pm. The official result of the referendum appears below. An independent examiner has been nominated and accepted by the Neighbourhood Plan Steering Group. He is: David Hogger BA MSc MRTPI MCIHT. The examiner has provided a Procedural Letter with an annex containing questions for the Qualifying Body (Disley Parish Council) and LPA (Cheshire East Council). This letter is available to view HERE. The Parish Council’s response to the examiner’s questions is available to view HERE. A hard copy of this response and the associated documentation is available at the Parish Council Offices. Cheshire East Council’s response to the examiner’s questions is available to view HERE. *******Further details, including the proposed plan and supporting documents can be accessed HERE. Hardcopies of the Neighbourhood Plan will shortly be available at the Disley Parish Council Offices and Disley Library. Please note: This consultation is being conducted in accordance with Government regulations and is being run solely by Cheshire East Council and all comments or representations must be made directly to them. The Neighbourhood Plan Steering Group, Disley Parish Council, the Parish Clerk or Parish Councillors cannot accept or forward any comments on residents’ behalf. The Neighbourhood Plan sets out a vision for the future of the parish and planning policies which will be used to determine planning proposals locally. Disley & Newtown Neighbourhood Plan Steering Group (NPSG) and Disley Parish Council are now inviting comments on the proposals in this Pre-Submission Version of the Plan before it is submitted to Cheshire East Council for formal consideration and wider consultation. The consultation opens for comments on 8th July 2017 and the deadline for comments to be received by is midnight on 27th August 2017. Disley Parish Council, 19 Buxton Old Road, Disley, SK12 2BB. The office is open Monday to Friday from 9.00am to 2.00pm. *********Complete the on-line form available on Survey Monkey HERE. All comments will be made publicly available on the Disley Parish Council website page after the consultation period and when the submission version of the Plan is released to Cheshire East Council. Comments will be identifiable by name, organisation or body. All other personal information provided will be protected according to the Data Protection Act 1998 and will not be made available online or otherwise. The results of the Business Survey are available to view HERE. There is due to be a public presentation of the results early in 2017 and details of this event are due to follow shortly. The Steering Group would like to thank all those residents who took the time to complete the questionnaires. The Neighbourhood Plan Steering Group (NPSG) would like to thank all residents who completed the recent Housing Needs Survey. We have received over 300 responses and are now analysing the valuable data provided. The NPSG are planning to present the results of the survey to the community. More details of this presentation will be announced soon. Disley Parish Council recently held two public meetings, including a presentation by Tom Evans, the Spatial Planning Officer at Cheshire East Council to help inform of the possible benefits of having a Neighbourhood plan, to gauge opinion as to whether they think it would be a good thing for Disley & Newtown and whether there was sufficient interest from residents in being involved by volunteering to be a member of a steering group of what is intended to be a community led project. These meetings were well attended and resulted in expressions of interest from residents who would be willing to volunteer to be active members of a steering group and the Parsih Council has now formally resolved to take a Neighbourhood Plan for Disley & Newtown forward. The Neighbourhood Plan will become part of the Statutory Development Plan for the Disley & Newtown area alongside Cheshire East Council’s Local Plan, currently being examined by a planning inspector. You may think “what is the point” because Cheshire East has already set out its stall in the Local Plan. However, the Local Plan is a high level document and there is still a huge amount of detail to be decided, such as very important land allocation work which will decide where and what sort of development will take place. There are 5 key stages in making the Neighbourhood Plan but there are also many other steps, including various legal processes along the way. minor amendments the plan must then be submitted to Cheshire East Council’s Planning Authority along with other evidence for a further 6 weeks’ publicity period. They will check that the plan complies with various criteria including whether the correct procedures for consultation and publicity have been followed. The Examination may take the form of written representations or a public hearing. An independent examiner will consider whether the Plan meets basic conditions, and that it complies with European obligations and national and local planning policies. The examiner will make recommendations to Cheshire East Council on whether or not the plan should proceed to referendum, subject to any modifications. If Cheshire East Council regards the plan as satisfactory, with modifications if necessary, it will arrange for a local referendum to be held. They must publish information on the plan and give notice of the referendum. More than 50% of those voting in the referendum must vote ‘yes’ for the plan to be made. The neighbourhood plan comes into force and will be used by the local planning authority when deciding planning applications. How long will the Plan take to prepare? Normally 18 months-2 years. However, emerging plans are taken into account in important planning decisions and help to inform the development of the overarching Local Plan. It must be stressed that a Neighbourhood Plan is not a plan to stop all development and to keep our community in a frozen state. It is a plan to deliver the development the community needs and a plan to decide where it should go. It is also a plan to decide what our community does not need and to be able to legally resist it. It is a plan put together by the community and the Parish Council, informed by trusted data about our community and its needs.